Despite hewing fairly closely to the facts, has trouble seeming truthful. Practically everyone behaves like an allegorical symbol rather than a person, a problem the script anticipates and acknowledges but only feebly attempts to solve. 135 min. Warner Brothers. Director: Clint Eastwood. Cast: Morgan Freeman, Matt Damon. With his latest Oscar contender Invictus, Clint Eastwood treats his audience as children. That's not necessarily such a bad thing, as indeed it's probably a good film to show to children. After all, it does deal with history in reasonably accurate broad strokes, and it preaches a message of universal tolerance while celebrating wise leadership. It's just a shame that Eastwood settles for storytelling that is persistently corny, with overstated dialogue the norm (and some overstated acting to match in supporting roles). The subject is South Africa in the years following apartheid. Working from John Carlin's book Playing the Enemy: Nelson Mandela and the Game That Changed a Nation, screenwriter Anthony Peckham begins in 1990, with Nelson Mandela at last free after twenty-seven years in prison for his organization of anti-apartheid sabotage. The film swiftly montages its way up to Mandela taking power as President in the historic democratic election of 1994. Newscasters clearly lay out his problems: economic growth, rising crime, and "balancing black aspirations with white fears." Keenly aware of the lingering, damaging attiudes of apartheid and apprehension that he will serve solely black interests, Mandela (Morgan Freeman) begins by reassuring old-guard staffers that they are welcome to join him in his work, and sets himself to building bridges by insisting on pairing his trusted ANC men with white Special Branch operatives to serve as an integrated presidential protection unit. Keeping an eye out for every opportunity to build universal national morale, Mandela takes a special interest in the divisive national rugby team, the Springboks. Though the team isn't performing well, it remains a popular tradition among mostly white Afrikaners, while blacks see the team's green and gold as symbols of the repressive apartheid era. Mandela sees another opportunity for healing compromise. Despite his own personal sacrifice, Mandela has determined to "turn the other cheek": as he tells his skeptical security head (Tony Kgoroge) of his team's integration, "The rainbow nation starts here. Reconciliation starts here...Forgiveness starts here too." Invictus is at its best in depicting the consideration of progressive leadership and, in particular, Mandela's ability to see the big picture: ostensibly, Invictus is about rugby, but while Mandela learns to love the sport, he seems more of a chess man at heart, gambling that his series of moves to invest in the Springboks can pay off in food for a country that's "hungry for greatness." With the 1995 World Cup looming, Mandela invites Springbok captain François Pienaar (Matt Damon, in false nose) to tea. Like Lieutenant Columbo if he were a world leader, Mandela makes canny implications: "How do we inspire ourselves to greatness when nothing less will do? How do we inspire everyone around us?" A gobsmacked Pienaar later tells his wife, "I think he wants us to win the World Cup." Yep, that's exactly what he wants, and in true inspirational movie fashion, he's going to get it. 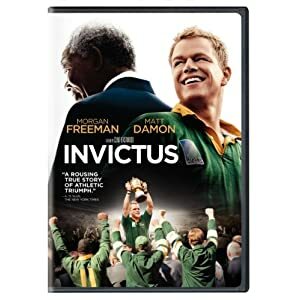 Though Invictus rapidly turns into a sports movie, there's not much indication, in athletic terms, of how the Springboks stepped up their game. Peckham and Eastwood suggest that the winning factor was a change of attitude, with the reluctant players (all white, save for the constantly singled out Chester Williams) learning from their captain to see the value in coaching clinics for African youth, African anthems, and the powerful story of Mandela's life journey to become their president and biggest fan. Underlining the latter, Pienaar organizes a team field trip to Robben Island, where Eastwood shoots Damon in Mandela's actual cell. Invictus is the sort of movie that, despite hewing fairly closely to the facts, has trouble seeming truthful. Practically everyone behaves like an allegorical symbol rather than a person, a problem the script anticipates and acknowledges but only feebly attempts to solve. One of Mandela's bodyguards blurts to another, "He's not a saint, okay? He's a man, with a man's problems." These problems include overwork that leads to dire health warnings (paired with Mandela's insistence on donating a third of his salary, this one sounds rather saintly) and separation from his wife and family (one scene depicts Mandela openly flirting with a younger woman). Despite the script's protestation, Mandela and Pienaar come across as essentially perfect, idealized leaders capable of miracles, but perhaps tellingly, only Pienaar is allowed to show anger. The last act of Invictus seriously bogs down in its lengthy, fragmented recreations of the rugby matches, which show us scrum after grappling, heaving scrum but never stoke the least bit of interest or tension. Again, the script seems to recognize the problem, adding three terribly manipulative scenes implying that a major terrorist event is just about to happen! (One of these incidents is rooted in fact, but it's poorly staged all the same.) Freeman does fine as Mandela, though he never quite captures the serenely sunny mask—or is it essence?—of Mandela's public image, which might have been more usefully played against an imaginative interpretation of his private self; Damon is just as serviceable as Pienaar, who at least has one or two moments where he seems to be thinking something other than "Will the Springboks win the World Cup?" 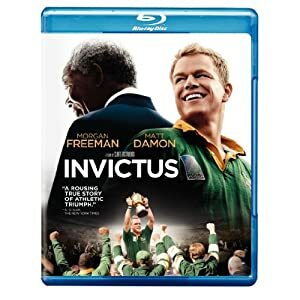 The overall impression of Invictus is that of a movie you'd never want to sit through again, one that seems to have left out most of the interesting stuff of its true story. Warner delivers a sturdy special edition for Invictus on Blu-ray. Though the image at time has a post-production polish that limits its film-like quality, the picture appears accurate to the filmmaker's intent, in its lightly tweaked color and contrast. Detail and texture are good, and the picture is free of any kind of distracting digital artifact, for an all-around impressive image. Audio comes in an absorbing, lossless DTS-HD Master Audio 5.1 mix that nicely prioritizes dialogue but also has power to support the rugby scenes with their on-field action and wraparound crowds. Blu-ray offers three exclusive bonus features, beginning with the Picture-in-Picture track Vision, Courage and Honor. It's a thorough examination of the film's making and the true stories that inspired it, featuring extensive interviews with the real-life figures, cast and crew, most notably director Clint Eastwood. Effectively, this serves as a video commentary, though not entirely screen-specific. The Blu-exclusive "Mandela Meets Morgan" (28:10, HD) is a making-of that begins with a focus on the star and his subject but branches out to Damon and Pienaar as well as other areas of production. Participants include Eastwood, Freeman, Damon, Playing the Enemy author John Carlin, producer Lori McCreary, producer Mace Neufeld, Mandela's executive assistant Zelda LaGrange, screenwriter Anthony Peckham, Tony Kgoroge, François Pienaar, Pienaar's wife Nerine, sports coordinator Aimee McDaniel, '95 Springbok/technical advisor Chester Williams, Scott Eastwood, producer Robert Lorenz, '95 Springbok Joel Stansky, costume designer Deborah Hopper,prop maker Dominic V. Ruiz, location manager Patrick Mignano, location manager Peter Currey, presidential protection unit member Linga Moonsamy, and head of presidential protection unit Jason Tshabalala. Also exclusive to the Blu-ray is "Matt Damon Plays Rugby" (6:49, HD), about the production's efforts (and especially Damon's) to achieve accuracy in the rugby scenes. Interviewees include Eastwood, Stransky, Julian Lewis Jones, Damon, McDaniel, McCreary, François and Nerine Pienaar, Peckham, Lorenz and Williams. "The Eastwood Factor" (22:23, SD) is an excerpt from film critic Richard Schickel's longer film of the same name, which follows Eastwood as he discusses his career and prowls the Warner lot encountering reminders of his many Warner shoots. Lastly, we get the "Invictus Music Trailer" (2:35, HD). All site content © 2000-2019 Peter Canavese. Page generated at 04/25/2019 06:27:00PM.